Blog From A Broad: holey tops, batman! The other day, I noticed my black t-shirt had tiny little holes in the front, just below my belly button. Annoyed, I chucked it thinking it must have been damaged in the washing machine. 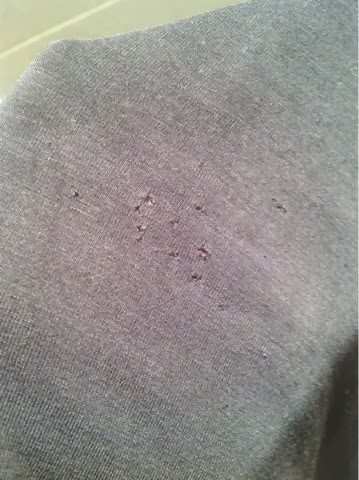 Then the second t-shirt got holes in the same spot. Then a third. Either some sort of moth was living in my navel (possible as I can't actually see it) or something else was amiss. Thanks to Google, I found out that this is a common occurrence when you switch to a granite worktop (counter.) It's caused by rubbing up against the edge and seems to affect jersey tops more than others. I cannot even make this stuff up. I suppose this means an apron is needed until I lose enough stomach or grow longer arms. Are you sure you don't have navel moths? Melanie, you'd have to check for me - shall we do that after my taxes? i don't wanna, you can't make me!